All Ferretti yachts for sale worldwide are listed below, scroll down to view them. The Italian yachts, Ferretti, are one of the most recognizable yacht brands worldwide and a leader in the pleasure boating industry. They are known for their high performance hulls, the fiberglass sporty flybridge models, their concept of smart design and the pioneering of a numerous number of functional and technical solutions setting new standards for the yachting industry. Ferretti Yachts, a Member of Ferretti Group, is the Group’s historical brand, building flybridge planing yachts in GRP (glass reinforced plastic) measuring 46feet / 14meters to 96feet/ 29meters. Ferretti yachts began in 1968 when the brothers Alessandro and Norberto Ferretti created the first nautical division of the family business, a specialist luxury car dealership. Three years later, in 1971, their first model, a wooden motor-sailer, was introduced at at the Genoa Boat Show. In 1982 the first Ferretti motor-yacht made its debut and the company began producing boats for sport fishing with an open and fly- bridge arrangement. The 1990’s were dedicated to research and development in nautical engineering with the start-up of the in-house engineering division and winning performances in offshore races. In 1993, Ferretti of America, Inc. was founded to market motor yachts in the USA, Canada, Mexico, Venezuela, and the Caribbean. From the second half of the ‘90s, after institutional investors acquired a share in the capital, an expansion strategy for external lines was started through the well-targeted acquisition of companies producing top of the range motor yachts. 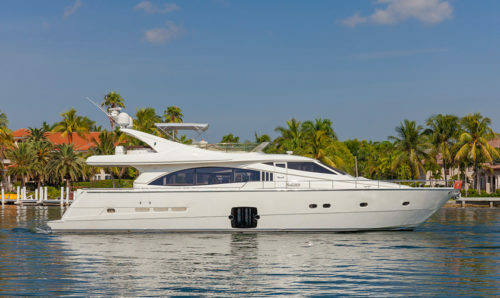 In 1996, Ferretti began operating in the segment of fiberglass flybridge yachts, measuring from 92feet / 28meters to 131feet / 40meters, through Custom Line. The group acquired Cantieri Navali dell’Adriatico – CNA S.r.l., specialized in building open motor yachts under the prestigious brand Pershing. In order to further complete its range, in 1999 Ferretti Group acquired C.R.N. S.p.A., a shipyard specializing in the production of maxi yachts and mega yachts with steel hulls and aluminum superstructures, measuring over 98feet / 30meters in length. In the year 2000, Ferretti purchased 100% of the capital of Riva S.p.A., one of the most prestigious and exclusive shipyards in the world. In May 2001 the parent company Ferretti S.p.A. acquired some assets of Oram shipyards in La Spezia, where the new Riva production area has been built. In November 2001, Ferretti Group acquired Mochi Craft S.r.l. shipyard in Pesaro. The Group took over Diesse Arredamenti, in order to acquire new skills in the nautical furnishings sector. In line with this strategy, in 2002 the Group also finalized the acquisition of Cantiere Navale Mario Morini in Ancona, enabling CRN to extend its production capacity. Ferretti Group acquired Itama, a prestigious brand specialized in the construction of open motor yachts, completing the range of the Group. In 2012, Shandong Heavy Industry Group – Weichai Group (“SHIG-Weichai Group”), one of the largest manufacturers of high-speed diesel engines in the PRC and a leading company in the power chain market, acquired the 75% of the share capital in Ferretti Group. Thanks to important investments in R&D, 2015 saw the launch of 6 new models, out of a total of 27 yachts that will be introduced by 2017. In February 2016, FSD (Ferretti Security & Defense) was born. The Group’s new division is active in the design, development and production of a new range of state-of-the-art naval vessels, with characteristics and mission profiles able to provide security, surveillance and defense of international and national waters and coastal areas. Ferretti yachts are fiberglass, planing hull pleasure yachts set to RINA A CLASS certifications. The Ferretti Custom Line, specializes in the production of fiberglass yachts ranging from 97feet / 30meters to 124feet / 38meters, and Ferretti Navetta, which serves as the brand’s semi-displacement, conforming to the needs for distance cruising without any sacrifice in comfort. The Ferretti Group boosts one of the most advanced production systems and can rely on highly efficient multi-brand plants, based in Forlì, Cattolica, Ancona, Mondolfo, Sarnico and La Spezia. The Forlì plant, the Group’s Headquarters, is one of the first plants of Ferretti Group where Ferretti Yachts, Itama and Mochi Craft yachts are manufactured. Opened in 2001, the production plant in Cattolica meets the most modern efficiency criteria and provides for simultaneous building of 16 motor yachts measuring from 66feet/ 20meters to 98feet / 30meters. The Mondolfo plant, a futuristic space, was meticulously designed to meet the continuing production developments and the expansion of Ferretti Group’s range, both in terms of number and boat size. The nautical facility in Ancona can accommodate the construction of ships up to 295feet / 90meters. It is a ‘multi-brand’ plant dedicated to the manufacturing of the entire CRN fleet, of some of the Custom Line models and it is also the shipyard where the Riva Super Yachts Division is hosted. The Sarnico shipyard is the cradle of the Riva history, where its legendary models have been built and where today the brand continues producing hulls from 26feet / 8meters to 66feet / 20meters: Iseo, Aquariva Super, Rivarama Super, Rivale, Sportriva 56’, 63’ Vertigo and 63’ Virtus. The production plant in La Spezia, opened in 2004, has a major strategic industrial, social and environmental role. This shipyard is Ferretti Group’s point of reference as for technical, logistics and sales support in the Ligurian and Tyrrhenian sea area. The La Spezia facility is the plant where the Riva and Custom Line mega yacht are manufactured and delivered. In 2005, Poseidon, the largest 5-axis milling machine in Europe for model building, was inaugurated. WEY and Hybrid Propulsion, both systems patented by Ferrettigroup. Hybrid Propulsion is a highly innovative system which includes five operating modes; it is the first system ever to have allowed for navigation at “Zero Emission Mode” on a yacht longer than 20 meters. SteerCommand & JMS which replaces traditional hydraulic steering and reduces the steering diameter by half. Floodable Garage, introduced for the first time on the Ferretti Yachts 960, which makes it possible to haul a tender with the utmost ease. The Convertible Top which easily transforms an open into a convertible model. Ferretti Yachts is fully compliant with the ECC 94/25 Directive, as well as having all its yachts “Ocean” certified as class “A”, which guarantees hull strength and safety under any sailing condition. In July 2016, the very first Ferretti Yacht 850 was launched in Cattolica. The new flybridge is 85.4feet / 26metres and is the epitome of how the largest yachts in the fleet have evolved, currently consisting of 10 models ranging from 45 to 96 feet. The marina at Cesenatico provided the backdrop for another event: the launching of the first Ferretti Yachts 450, the vessel taking the brand back into the strategic 40-50 feet segment. This yacht stands out for the geometrical lines of its hull, its generous volumes, and its elegant yet practical interiors designed to create a family feeling alongside its “big brother”, the Ferretti Yachts 550.